You're going to be hearing a lot about a new live-streaming app called Meerkat. You're going to be hearing a lot about a new app called Meerkat. Meerkat enables you to stream live video from your phone. The quality of the stream is very good. You can stream for an unlimited amount of time. And it's free. When you start streaming with Meerkat, the stream is automatically announced on Twitter in a tweet with a link to the stream on the MeerkatApp.co website. It's also announced inside the app for users who are following you on Twitter and also using Meerkat. Replies to the tweet are treated as comments, which show up superimposed on the live-streaming video, at least for users who are viewing in the app. Meerkat live video streams, which are being called "Meerkasts" (a word that Jason Hitchcock claims to have coined), are almost real-time. There's a delay of about 30 seconds, give or take 20 seconds. Plus, you can schedule them so people know when to tune in. At present, Meerkat depends entirely on two products: Twitter and Apple's iOS operating system. You need both. Twitter is required for user identity and comments. The streaming feature is only possible with iOS. Meerkat has released an unofficial Android app for viewing Meerkat streams, but it doesn't work very well yet. Expect full Android support in the coming weeks. The company that makes Meerkat is called Life On Air. Its CEO, Ben Rubin, says a huge number of people watch Meerkat videos for hours every day. And it's true: It's super compelling to watch Meerkat videos. And it's super compelling to stream them. 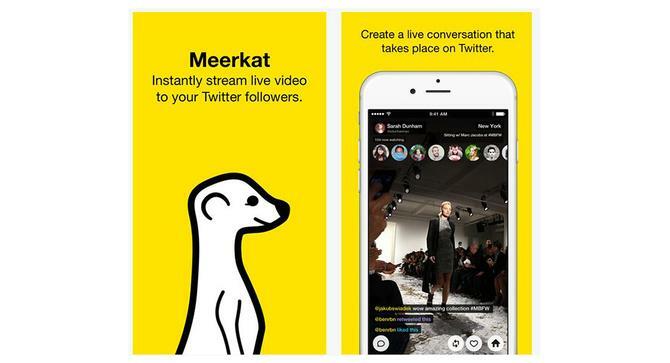 Meerkat has achieved that rare balance of features that make it a crowd-pleasing hit. Here's why it is so appealing. I watched Google's live-streaming Hangouts on Air feature take off on Google+. Everybody was talking about it. But eventually it came to be used by only three kinds of people. The first was a tiny minority of Google+ users who were bold, verbose and engaged enough to enjoy the spotlight. The second was another tiny minority of people who were invited to participate in officially organized panels and press-conference type events. And the third was yet another tiny minority -- performers. Musicians, actors and others took to Hangouts on Air to find an audience. The trouble with those three groups is that they were minorities of the total user population, not majorities -- and majorities are required for something to go mainstream. There are a million reasons for people to be wary of joining a Hangout on Air. They might not want to appear on camera -- or perhaps they don't want their homes to appear on camera. Or they might be concerned that they'll do something embarrassing and it will be posted on YouTube forever. For reasons like those, and many more, most people never wanted to do a Hangout on Air. While Hangouts on Air felt scary and consequential, Meerkasts feel far less so. Watching a Meerkast is also an introvert-friendly activity. Viewers get to participate, but only with their words. They don't have to put their faces on video in order to participate in a conversation. Lurking is the default mode, but anyone can chime in at any time. There's something about having a camera in your face (with the knowledge that lots of people are watching) that causes people to perform -- to be fake. If you look at YouTube stars -- and, well, everyone on YouTube who has a vlog or "show" or recurring posts -- you'll notice that they're not being themselves. The more successful YouTube personalities have figured out how to fake authenticity, and that's one of the reasons they're successful. People crave authenticity. Because Meerkat is ephemeral and the audience is involved through the on-screen comments, it's much easier to be yourself during a Meerkast. In the early days of Google+ Hangouts, I called in this space for everyone to try "ambient Hangouts." The idea was that instead of feeling the pressure to talk or do something while you're in a Hangout, it's OK to just connect via video and go on with your day -- as if you and your friends were in the same room. It didn't stick. A Hangout makes you feel like you're on stage in front of a microphone. Meerkat, on the other hand, is great for ambient video streaming. I've streamed Meerkasts for hours at a time while I'm doing other things like working, or even hiking, and it's very easy and comfortable to do. (I think my record so far is five hours.) People enjoy a window into the lives of others. And because Meerkasts can be so informal and inconsequential, watching can be ambient, too. As I write this, I'm watching a Meerkast by someone named Ben Young, who's simply showing a spectacular view out his window in Manhattan. I feel like I have that window, even though I'm in California. On Wednesday, Rubin said on CNBC that "watchers are part of the content." Here's what I think he means by that: When the "watchers" comment on a Meerkat video stream, those comments appear right there on the video. They're not below it or on another page. It's also interesting that Meerkat creates a space on Twitter where everybody involved -- the Meerkasters, the watchers -- participates in the same conversation. The person or people on the video get feedback from the people watching. The people watching can influence the people on the video and also talk to one another. The single biggest advantage of Meerkat over Hangouts is that it's mobile. You can't initiate a Hangouts-on-Air session from a mobile device, so most Hangouts are panels of talking heads, or a single talking head. Meerkasts, on the other hand, often happen at parties, protests (this week in Ferguson, for example) and conferences -- mostly the tech and culture event SXSW, which is happening now, and which will truly propel Meerkat into the mainstream. Point is, making it mobile takes live video streams out of people's home offices and into the wild, where things happen. Ephemeral media are great, but they tend not to scale or go viral. Meerkasts, however, can. And will. The reason is that people are rapidly adopting Meerkat. And it's just a matter of time before freak occurrences, natural disasters, unbelievable crimes, plane crashes, the Oscars or other highly newsworthy events are streamed via Meerkat. After a few such events, people will feel compelled to stay glued to users or sites or Twitter feeds that point to links to breaking news events that are being streamed via Meerkat. Nothing can stop Meerkat now. Twitter last month quietly acquired (the news broke this week) a startup called Periscope, which makes a Meerkat-like live streaming app that hasn't been released to the public yet. Twitter tends to shut down or shut out sites that use its platform for monetization in ways that Twitter could do itself. So the Periscope acquisition could be the first step in taking over the live-streaming-via-Twitter idea that Meerkat currently owns. And according to Mat Honan at BuzzFeed, Twitter has just unceremoniously blocked Meerkat's access to its "social graph," thereby rendering Meerkat's contact import feature inoperable. A Twitter spokesperson tells BuzzFeed that its decision to cut off Meerkat's access to its social graph is "consistent with [Twitter's] internal policy," but that comment doesn't fully address concerns that Twitter has other business interests at play here. On Friday, Twitter announced that it had purchased Periscope, an app that, like Meerkat, lets you share live video streams via Twitter. Either way, Meerkat-like live streaming via mobile is here to stay. And Meerkat is also here to stay, although it may eventually be forced to find a home elsewhere.